An assembled pair of late 19th century cast iron garden benches. 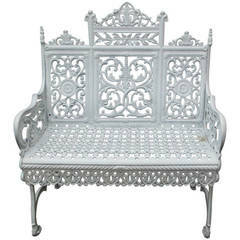 This Gothic pattern bench is seen in the garden of the White House, and therefore has been referred to as the White House garden bench. The benches are of slighty different sizes which is only noticeable when next to one another. The measurements are: 42.5 wide by 34 tall by 20 deep and 44 wide by 35.5 tall by 20 deep. The benches have been freshly painted white. Measures: 42.5 wide by 34 tall by 20 deep 44 wide by 35.5 tall by 20 deep. 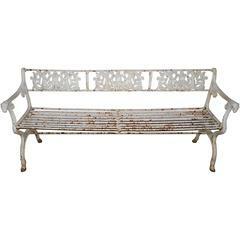 Cast iron Gothic pattern garden bench, decorated with a trefoil and quatrefoil reticulated back. Painted in the last 20 years. Pair of black Gothic style cast iron garden benches with open work seat and back.